I actually enjoyed this one more than the first one. I wasn't sure, going in, what to expect to get from this. 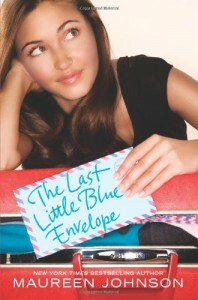 I liked 13 Little Blue Envelopes, but I didn't like it as much as I thought I would, so I left it a bit disappointed. However, I left this one quite happy with where the story went and how it was all tied together. I really like Maureen Johnson's writing and how she incorporates wittiness and sarcasm into her characters. The storyline was a smidgen predictable, in the broadest of the term, but there were still some nice surprises along the way. This isn't a heavy read, or a life-changing, thought provoking read. Yes, there are some nice insights made, revelations to be had, but overall this is an upbeat story that I felt fairly light after reading it. I like that.